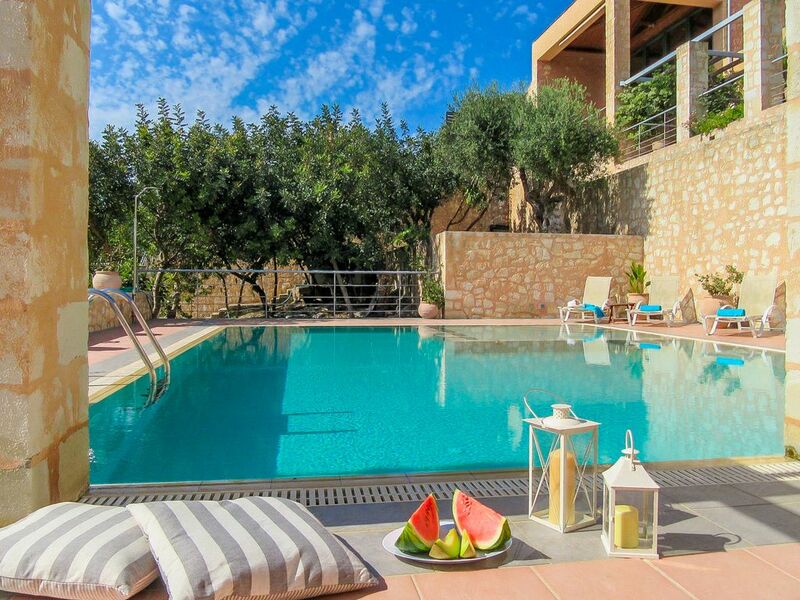 Villa Athina is a stone built villa in the traditional village of Gavalochori, 25km east of Chania Crete. Its unique architectural style is combined with modern facilities in order to provide an ideal environment for your holiday. The villa features 300 m2 of living space on a 1000 m2 plot of land. It offers complete privacy with its own parking space for two vehicles, garden and pool. The villa can accommodate up to 10 guests. It offers a stunning view of the White Mountains. Each master bedroom has en suite bathroom equipped with bathtub with hydro-massage. Pool size is 16m x 6m. Up to two cribs and high chairs are provided for infants. A computer with internet connection is provided. Free WiFI access. The only reason I did not give a 5 was due to the beds being hard. Otherwise it is a fantastic property!!! we had very relaxing holidays with the great pool in our house and also a fantastic view. Enjoing the sunset we sit in our garden area and had a very good time in gavalochori. Also the little village of gavalochori was very nice and we love it. Booking process was extremely smooth, and Christos helpful throughout - also putting us in touch with local car hire people as the big names at the airport were looking to charge us crazy prices. First impressions of the villa were extremely positive: airy, spacious, clean, modern,. Plenty of room for our 2-family party of 4 adults and 4 children aged 11-15. Pool area nicely laid out and big enough for all to get in for ball games without being cramped together. Great views across the valley towards the setting sun of an evening. Froso the cleaner was an extremely smiley and helpful daily presence. Whilst this is on a development with a number of other villas, you are not overlooked - and whilst we were aware of others coming in and out of the shared driveway, privacy is maintained. Air-conditioning is plentiful, and works extremely well. There were issues with the washing machine and tumble dryer during our stay, but Froso kindly offered to take our washing to another villa to get it done while the problems were fixed - so no inconvenience was caused. All in all, the villa itself fully met our (quite high, bearing in mind the quite high price!) expectations of it. The one thing it did however lack, which has been a feature of all our previous villa holidays was a visitors' book where we could learn from the experiences of others and add our own comments for the benefit of others. So let me quickly do that here. Gavalochori - sweet little village, Monica's tavern at the bottom of the hill does good Greek food and puts on some decent music nights. Almyrida - closest beach, shallow, nice swimming but can get busy and we just went there once. Closest bank. Kalvyes - sweet little town, the beach bit is hidden behind a wall as you come in from Almyrida and looks a bit forbidding. Go in - the bay is nicer than Almyrida and in Il Forno you have the best restaurant with the best front-of-house guy you'll find all holiday. Georgioupoli - our favourite beach, we went past the busy main drag and round the corner to the beach club area. Paradiso was our favourite. Chora Sfakion - lovely 1 hour drive over the mountains. Watch out for the nudist beach & hotel on the road in, we tried to stop there for lunch! Chora itself not too inspiring, back past the nudists we found a lovely stone beach and great Taverna somewhere called Koumelas or similar. Rethymnon - pretty, nice hustle & bustle of an evening. Try the Lemon Tree restaurant. I can't recommend this villa or its owner, Christos, highly enough. Everything about it was as good or even better than expected, and between Christos in the run-up to our holiday (who responded to multiple emails speedily and helpfully) and the wonderful housekeeper Froso during it (who did countless things to make our stay as easy as possible, including finding a birthday cake! ), we couldn't have asked for more. The location is perfect - a few miles away from the busy coast but within walking distance of a couple of small shops and two or three fantastic restaurants. The villa itself is spectacular and so cleverly designed - you would hardly know it was in the middle of a line of four similar properties. There was ample space for our party of eight both inside the villa and also in and around the pool, where many of our group spent most of their time. If you're thinking of hiring this villa then just go ahead and book it - you won't regret it. We had a wonderful break and look forward to hopefully returning one day. Thank you Christos and Froso! Wonderful place to stay with family and friends! This villa has everything you need for a family vacation. The rooms are beautiful and spacious. I especially loved the sunset views of the valley and White Mountains. The villa is tucked away in a small village and is off the beaten path. We thought this was a definite plus and the beach was only a few miles away. There is a grocery store, bakery and excellent restaurant within walking distance of the villa. My kids loved the pool and fruit trees in the gardens! We would definitely stay here again in the future. Gavalochori is a traditional Cretan village situated in the Apokorona region about 3km inland from the coastal village of Almirida. Gavalochori is an old historical village with approximately 500 residents. It is a typical Cretan village with a small square where a coffee shop, a bakery, a mini mart, two tavernas and other convenient stores can be found. Several narrow streets branch off its centre and one could wander through several interesting sections of this officially protected village. Stone built houses with lovely backyards full of colourful flowers can be found. A lot of interesting buildings can be seen, such as the 18th century two room, arched olive oil press, the temples of Panagia and Agios Sergios, the old school, and the historical folk art museum. Within a short distance (5km) from tranquil Gavalochori one can drive to Almirida, a picturesque coastal village. You may dine there in one of several seaside tavernas or relax sipping your drink by a bar during sunset.